Ahh...if you have $41.00 in your pocket, go over to Nice One Nails in Brooklin and get yourself a manicure and pedicure. 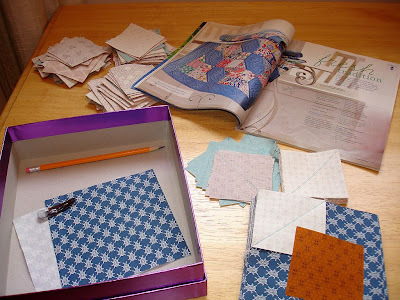 I went there today with Stephanie from Eat, Run, Quilt! Fabulous!! Not much going on, just the usual January blahs. We've been lucky that there has been very little snow this year but some very cold days. If you remember I had said earlier that I was working on a boy and girl quilt for a set of twins born to my Big Man's co-worker. The girls is done except for the hand stitching of the binding to the back. Below is the startings of the boys quilt. I really like this pattern so far, incredibly easy. Now I FOREWARN YOU.....the next picture is pretty gruesome.....the Big Man had to get a mole cut out of his back for precautionary measures. 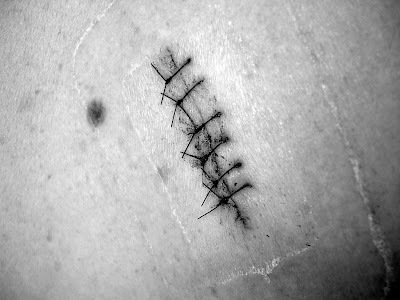 The cut is about the length of a thumb but has been healing beautifully. It's only been two days and it looks great....if that's actually possible. I hope everyone is keeping well....SUPERBOWL is next weekend, must jog extra hard and long this week cause I see a feast in my future next Sunday! My Big Man had to work over Christmas so I took advantage of 4 days off from work to re-paint and organize our bedroom. Below is the final result. 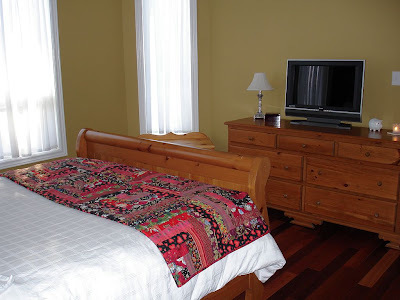 Before, the TV used to be mounted on the wall and there was a mirror on the dresser that drove me crazy because it was always dusty. 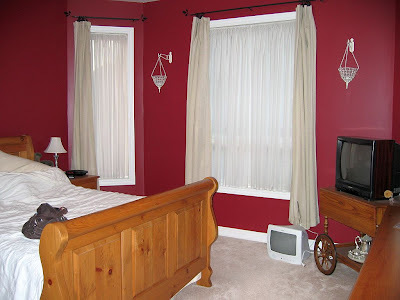 Originally the bedroom walls were a dark red. 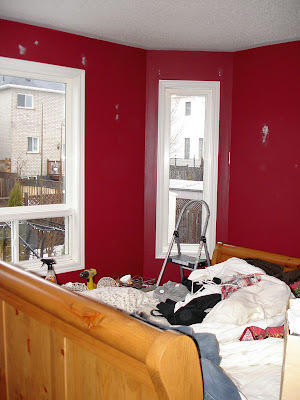 It was a Ralph Lauren paint colour called "Thoroughbred Red". I loved it but I had used an eggshell paint finish that showed all the imperfections in the walls and major dust bunnies. There were dark brown curtains and sheers on the windows. I forgot to take a before picture; this is the best I have at the end of the first prep day, Christmas Day. UPDATE: My Sister in Law from New Zealand just sent me this picture of our bedroom before! Thanks C!! 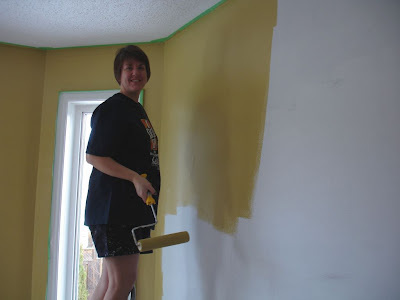 On day two, Boxing day, I primed all the walls with Sico brand primer. I hadn't noticed when I purchased the primer that it was oil based. It was super smelly but one coat provided an excellent fresh canvas. Day Three was one coat of paint in the morning. Shopping for new pillows, a duvet and cover from Sears in the afternoon. Finished with a final coat of paint that evening. 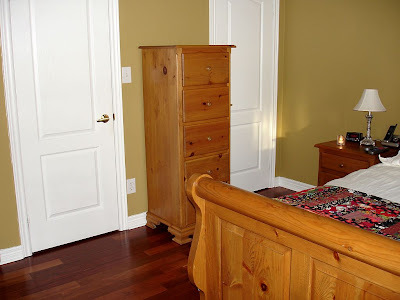 Again I used Sico Cashmere paint in a Benjamin Moore chip colour called "Princeton Gold" that I stole from a friends dining room. I love it, it's gold in the day but greenish at night. Notice the new blinds. In the picture above, the are pulled up, but they also have the option of dropping down from the top. 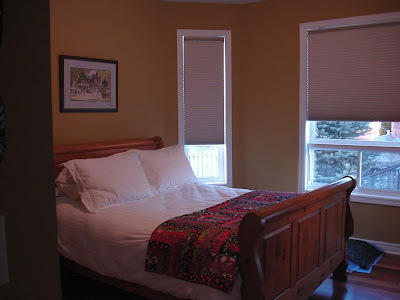 They are an accordion pleat style with a metallic room darkening core to help when the Big Man is working midnights. 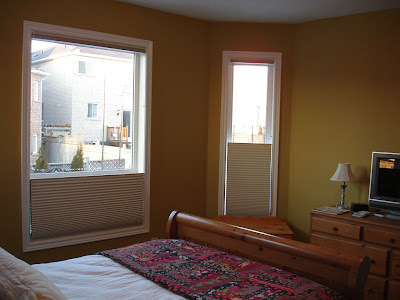 We purchased them from "Blinds to Go" in Whitby. Pricey but I would recommend this store -- excellent employees, ordered on a Sunday afternoon and they were ready for pick up by 10 AM on Tuesday. I moved the bed closer to the window, the tall dresser used to be where the bed side table is now. With the curtains gone and the new furniture arrangement the room feels so much bigger. On the final day I painted all the trim and baseboards. 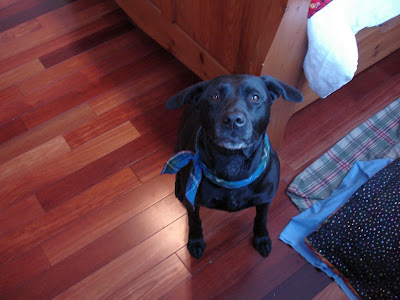 Girly was really good and never bugged me once. We're so happy with the end result. It is fresh and new and feels like being in a hotel room.